The two steel plates are ‘tacked’ together. 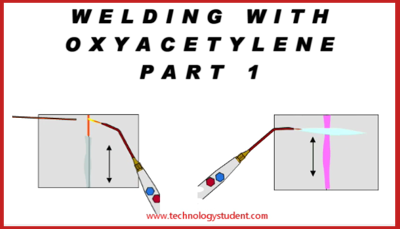 This involves welding in two or three places, to hold the plates together. The entire joint is welded, slowly and accurately. The flame is focus at one end of the joint, forming a small pool of molten steel. The welding rod / filler rod is introduced to the flame, as the pool is slowly ‘pushed’ down the entire length of the joint. The joint is allowed to cool slowly. When cool, the ‘slag’, which forms during the welding process, is tapped away using a welding hammer. The joint can now be inspected for accuracy and strength.